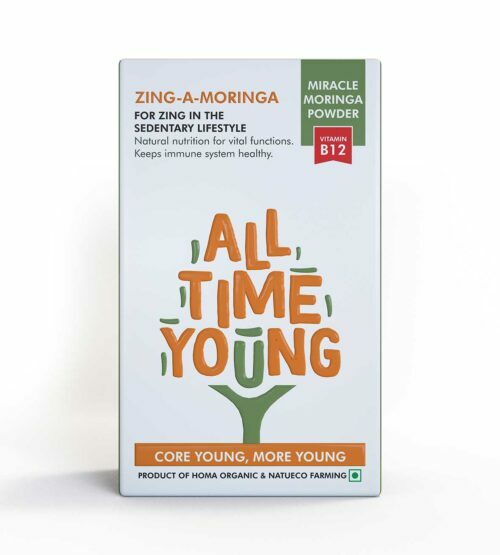 All-Time Young’s Moringa Leaf Powder is perhaps the only organic moringa powder which is a natural source of Vitamin B12 ( owing to Natueco farming). Natural vitamin B12 is rarely found in vegetarian food. 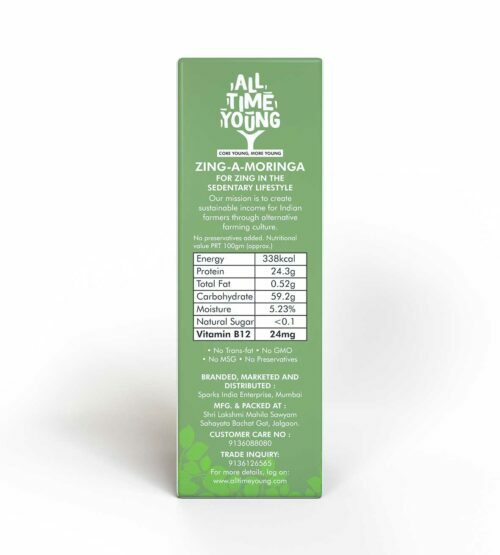 Zing-A-Moringa is one of the best natural superfoods that provide complete nourishment to all your vital organs thus building your immunity. Simply add Zing A Moringa ( natural B12) to your cooking( in tadka or by sprinkling it in curries, pulav or parathas) (No change in taste). Vitamin B12 is an essential vitamin for your entire family. Best Time To Have: For best results take (10gm a day). 5 gm in warm water on empty stomach in the morning & evening and after dinner during bedtime. 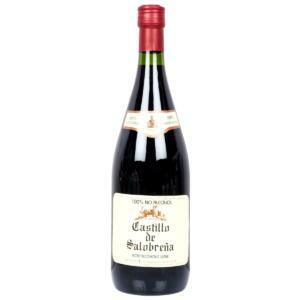 How To Use: Dissolve 5gm or one teaspoon in 200ml warm water and drink. You can also mix it in curd or honey. For specific ailments, consume only in warm water. Simply add Zing A Moringa ( natural B12) to your cooking( in tadka or by sprinkling it in curries, pulav or parathas) (No change in taste). Vitamin B12 is an essential vitamin for your entire family. Best Time To Have: For best results take (10gm a day). 5 gm in warm water on empty stomach in the morning & evening and after dinner during bedtime How To Use: Dissolve 5gm or one teaspoon in 200ml warm water and drink. You can also mix it in curd or honey. For specific ailments, consume only in warm water. 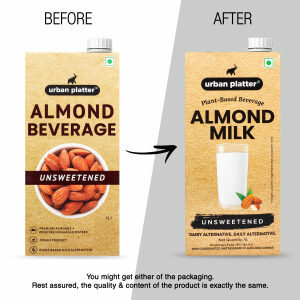 Ingredients: 100% Pure & Natural, Dehydrated, Shade Dried Moringa Leaves Powder. (No Stem, No Stalk, Only Pure Leaves). Did You Know? 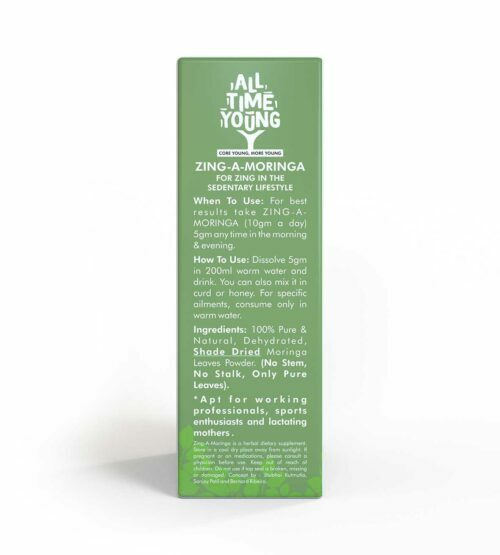 Zing-A-Moringa leaves are the leaves of drum-stick tree fondly called as Miracle Moringa Tree. 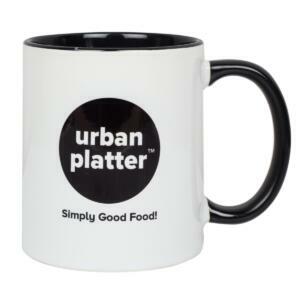 It boasts of highest nutrition levels & supports environment conservation. It is one of the best superfoods for health.